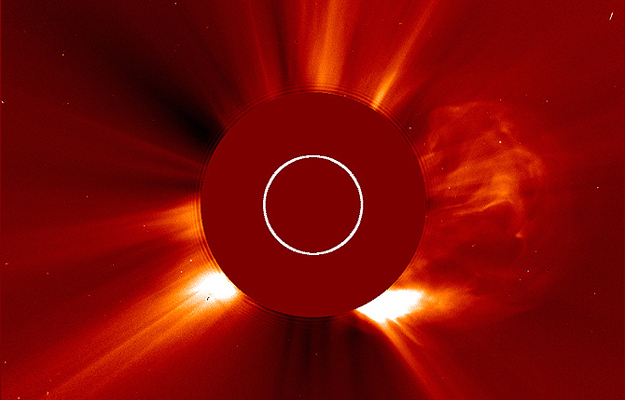 July 23 Coronal Mass Ejection captured by STEREO-A (Credits: NASA). This particular event was not headed for Earth, providing a good opportunity to observe it without experiencing its hazardous effects. Among those effects, generation of a sizable magnetic field at 80 nanoTesla. That is not quite as large as the Carrington Event of 1859 which set fire to telegraph equipment, but substantially larger than the so-called Halloween storms of 2003 that put out power in Sweden and required rerouting of aircraft.